The official opening event to kickoff ATD’s International Conference, was our 44th President, Barack Obama. 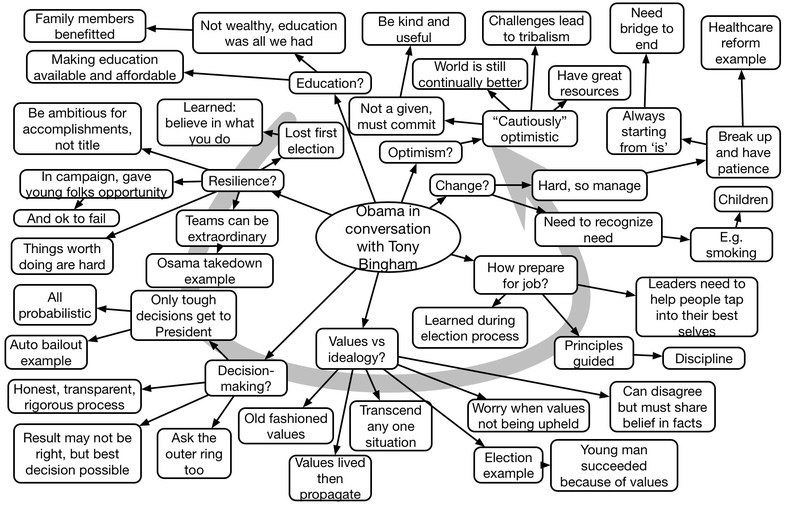 Prompted by questions from Tony Bingham, he eloquently addressed education, values, and more. Thoughtful, witty, and ultimately wise, an inspiring session. PS: it made me smile cuz I teach about the integrating power of mindmaps but took zillions of linear notes instead! Thanks for the reminder! As I told Vicki, and I’ll tell you all here: my blog is CC:BY-NC-SA. So you can share with attribution. Just no using to make money (at least not without me getting a cut ;), and similarly sharing any derivative works under the same license.